A Cavallo Cute Little Hoof Boot. 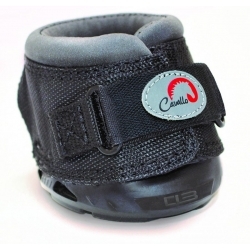 The Cavallo Cute Little Boot has been designed specifically for miniature horses, small ponies, foals and donkeys. 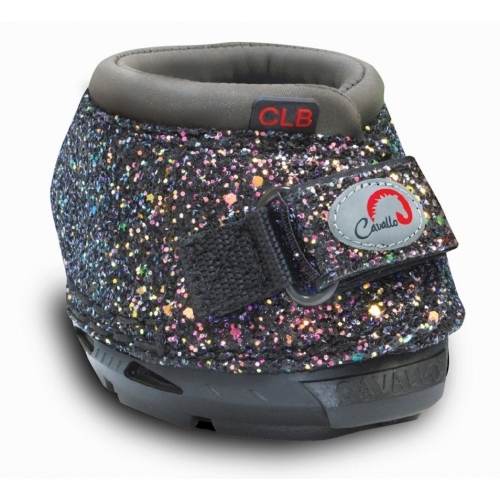 They are quick and easy to apply and it is the ultimate hoof boot option for tiny hooves. Available in Black or the Shiny Bling Colour. Cavallo Cavallo Cute Little Hoof Boot features are as follows - See Additional Images! Suitable for: Miniature Horses, Ponies, Foals and Donkeys with slightly longer than wide hooves. Ideal for everyday riding, light driving and therapy for any small horse whose measurements fit the size chart correctly. It's easy to adjust upper allows you to fit different sizes and angles and upper folds flush with the base of the boot for ease of application. Not suitable for: Miniature Horses, Ponies, Foals and Donkeys with round, flared or wider than long hooves. Unless for therapy where you can pad out the hoof boot. For any assistance with choosing the right type and size of Hoof Boot please do not hesitate to email us on sales@urbanhorse.com or call us on 01434 422700 - We are here to help you find the right boot for your horse / pony!